In 2002, Peter was able to attend the first foreign seminar of the newly formed Aikido Yuishinkai, and its founder, Master Koretoshi Maruyama Sensei. After receiving ukemi for Sensei, Peter realised he had found the teacher his Sensei had asked him to find, and committed himself to study Aikido as taught by master Maruyama. In 2004 Peter established his dojo, Seishin no Shugyo dojo, The Aikido School of Excellence in Hobart Tasmania, and has been teaching from this base ever since. Peters hero is Tessu Yamaoka, the Japanese sword master and Zen calligrapher, and a piece of his calligraphy takes pride of place within the Shomen of the dojo, and is in fact the dojo namesake, Seishin no Shugyo – to train the spirit. 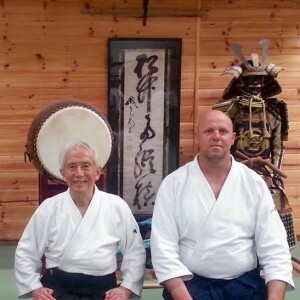 In 2014, due to his technical excellence Master Maruyama appointed Peter to the position of Chief instructor of Australia, and in 2016 appointed him to the position of International Instructor.